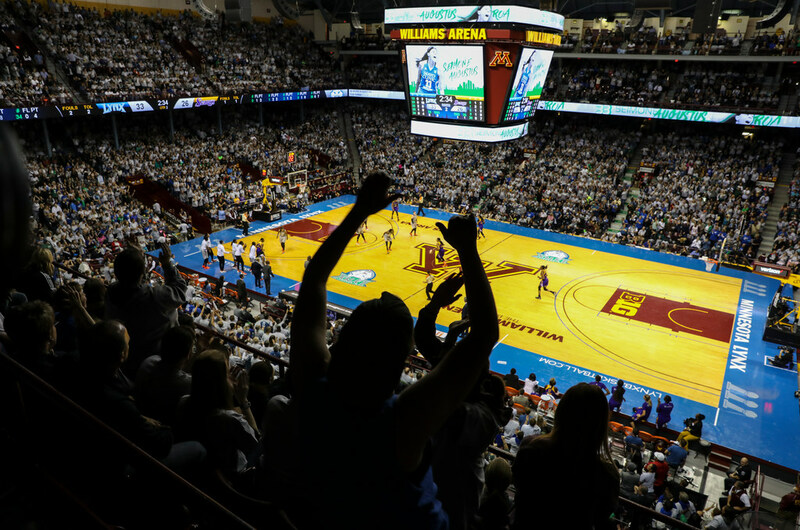 Williams Arena was sold out for Game 5 of Wednesday’s WNBA Finals between the Lynx and Sparks. As it turns out, the enthusiasm in the Twin Cities extended well beyond the confines of the Barn. ESPN released television ratings for the game on Thursday morning. Nationally, the broadcast on ESPN had a 0.8 metered rating from Nielsen — twice as high as last year’s 0.4 for Game 5 between the same two teams. Last year’s game was shown on ESPN2 on a Thursday and competed against both the MLB playoffs and an NFL game. Locally, the Twin Cities market posted a huge 7.9 rating. That was more than three times as high as any other market and dwarfed the 0.9 rating from Los Angeles, where the Sparks play. One rating point in the Twin Cities equals about 17,000 households, meaning roughly 136,000 had the Lynx game on last night. By the way, if you were watching the game and wondering why ESPN cut away for about 30 seconds right after it ended to show a different highlight from an NBA preseason game, a network spokesman tells me that’s standard practice at the end of any series. It allowed ESPN to set up for the trophy presentation.